Animal magnetism, in its original sense, had nothing to do with attraction between the sexes. It referred to an invisible form of life-energy (analogous to many similar concepts such as prana, qi, orgone and Odic force), postulated by a German physician named Franz Mesmer (1734 - 1815). Mesmer developed a number of healing techniques based on the theory of animal magnetism... one of which is still in use under the less controversial name of hypnotherapy! 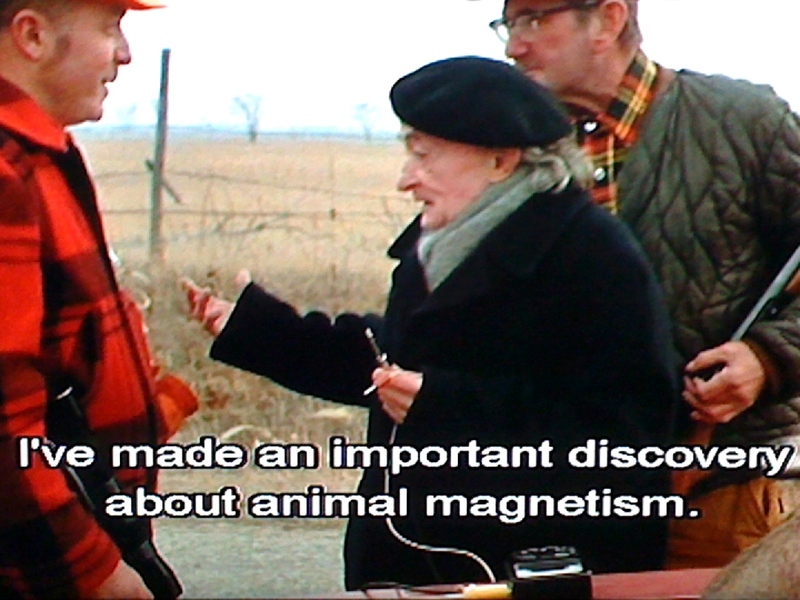 Animal magnetism is a pet subject of one of the characters in Werner Herzog's 1977 film Stroszek. 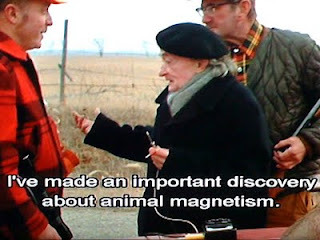 Herr Scheitz (seen on the left talking to two bemused farmers) is an elderly eccentric who walks around testing people and objects with an ordinary multimeter. This is what Scheitz (who is played by an actor named Clemens Scheitz!) 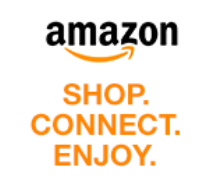 has to say about the subject: "I have managed to make an exciting discovery. Animal magnetism, as described by Mesmer, can now be measured by me, which was previously impossible. Even as a child I knew that one day I would succeed in measuring this animal magnetism... Animal Magnetism is now called hypnosis, perhaps not quite rightly so. The fact that it can be measured is also indicated in Schopenhauer's book On the Fourfold Root of the Principle of Sufficient Reason." Arthur Schopenhauer (1788 - 1860) was one of the most highbrow philosophers of the nineteenth century, so it comes as no surprise to learn that his doctoral dissertation, On the Fourfold Root of the Principle of Sufficient Reason, does not, in fact, have anything to say on the subject of Animal Magnetism. However, one of Schopenhauer's later works, On the Will in Nature (1836) really does contain a chapter entitled "Animal Magnetism and Magic"! Stroszek can be found in a boxed set of Herzog's early work, together with two other films that feature the acting talents of Clemens Scheitz: The Enigma of Kaspar Hauser (1974) and Heart of Glass (1976). In the latter film, Scheitz and most of the other actors played their parts entirely under hypnosis! The story of Kaspar Hauser will be familiar to most Forteans, as it is featured in countless books of "strange phenomena" (including Charles Fort's own Lo! ), as well as many fictional works proposing a variety of supernatural or alien origins for Hauser. Herzog's film is almost unique in that it takes Hauser's story exactly at face value... and so do all the characters in the film (in reality, Hauser was surrounded by people who didn't believe his story). If you haven’t seen the film, this may sound rather self-defeating, but in fact it serves to put the whole focus of attention on the strangeness of Hauser's own personality. At the end of the film, after Hauser's autopsy, it is Clemens Scheitz who has the last word: "Today is a day to remember... deformities discovered in Kaspar Hauser's brain and liver! Finally we have got an explanation for this strange man!"